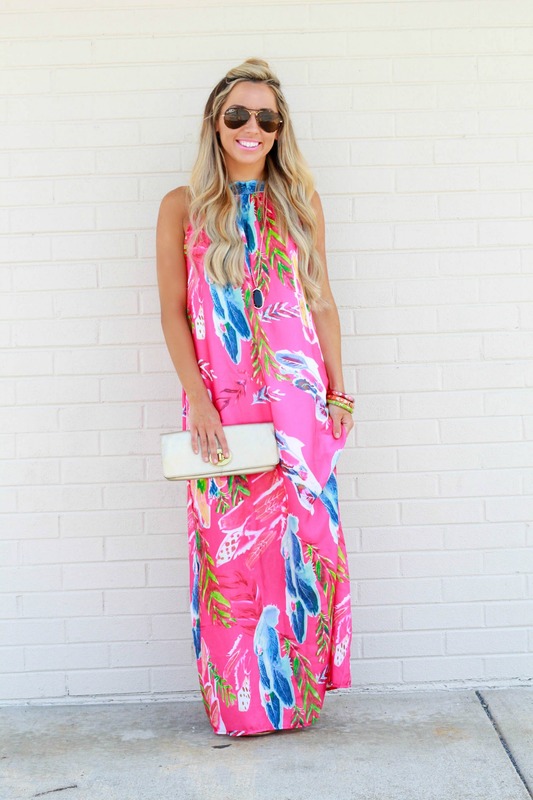 Pink Printed Maxi Dress – Only $15! Fall may be filling up in stores but it’s still been well in the 90’s here every single day. I’m trying to soak up every last ounce of summer while it’s still here because I know on that first cold day I’m going to be wishing it was still summer! 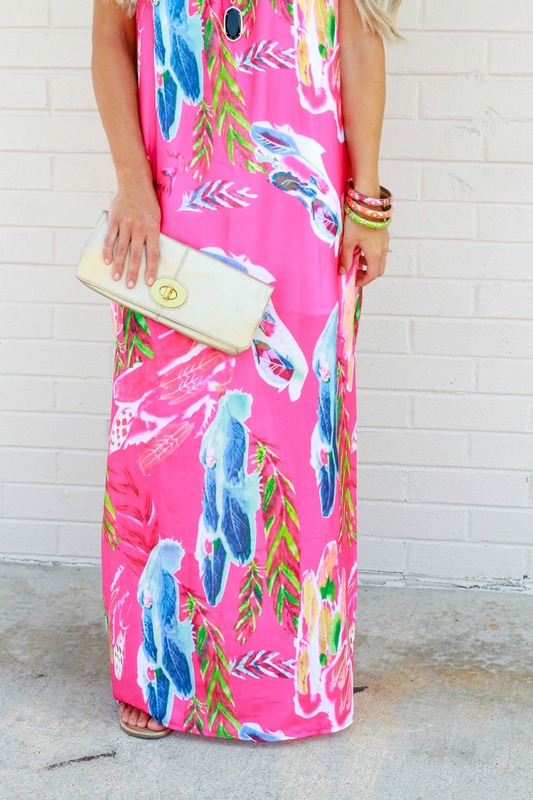 This Maxi dress from Light in the Box is just as vibrant and colorful in person as it is in these pictures. It’s so fun and the colors and pattern are great for summer or a tropical getaway. I love the length of it because I’m actually able to wear sandals with it! Sometimes that’s impossible to do with a maxi dress especially being only 5’2″, but I think it helps keep the look a little bit more casual which is what I wanted. Also, did I mention the dress is only $15? Crazy right? I pumped it up with some gold and fun bangles to go all out on the summer vibes. The fit of this is great – but unless you’re wearing it as a coverup over a bathing suit, it does require a white slip underneath. Luckily I have a basic white and a tan slip that I whip out every once in awhile – and the short white one did the job. 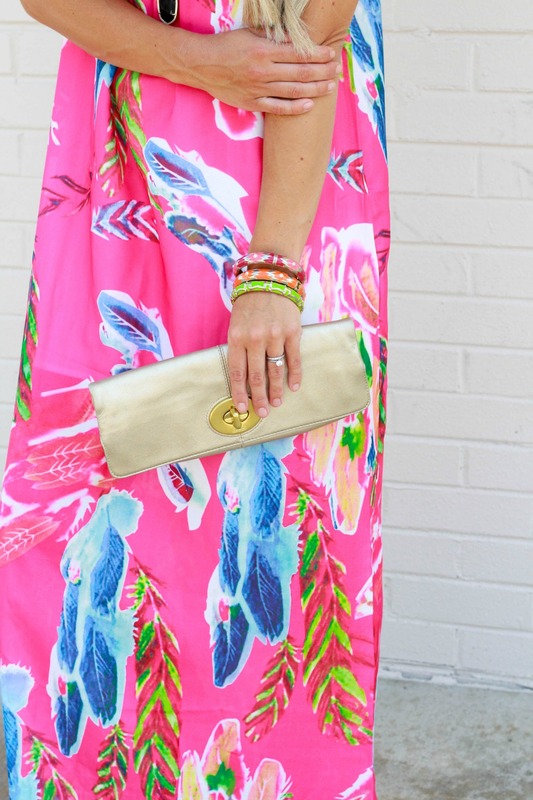 Bright colors always look awesome with gold, and these must have staple Tory Burch Miller Sandals were the perfect match. I have had them almost two full years now and have definitely gotten my wear out of them, but they are still in great shape! 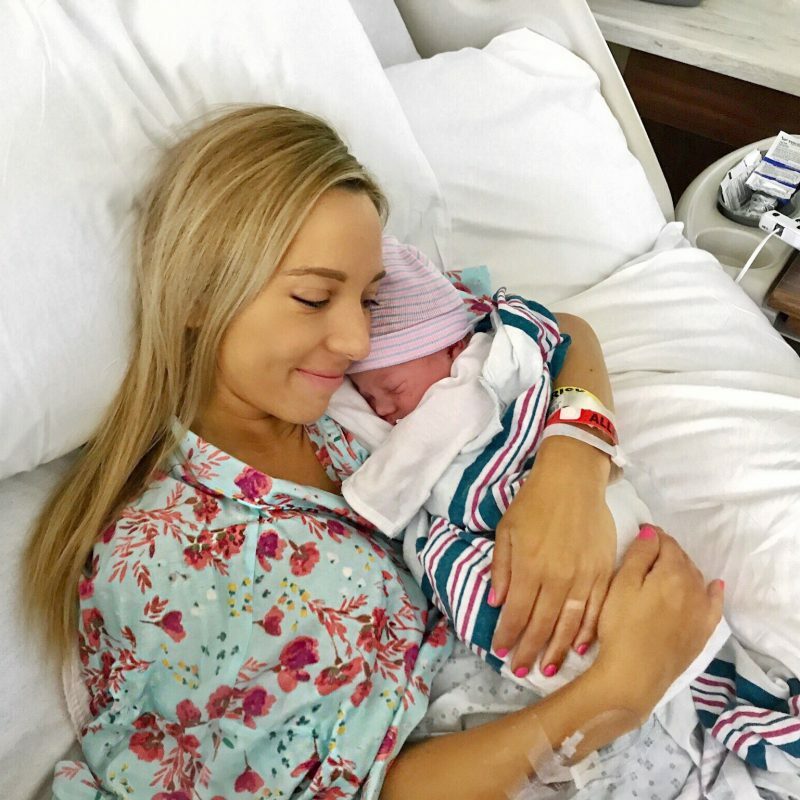 If you haven’t already make sure you sign up for liketoknow.it so you can easily shop my looks, or simply get the details straight to your inbox! Its free and easy to sign up – and you can control the frequency and amount of the emails. Thanks for stopping by! Hope you loved this look as much as I do! Previous Post Fringe Kimono – Great Transitional Piece! This dress is so much fun! 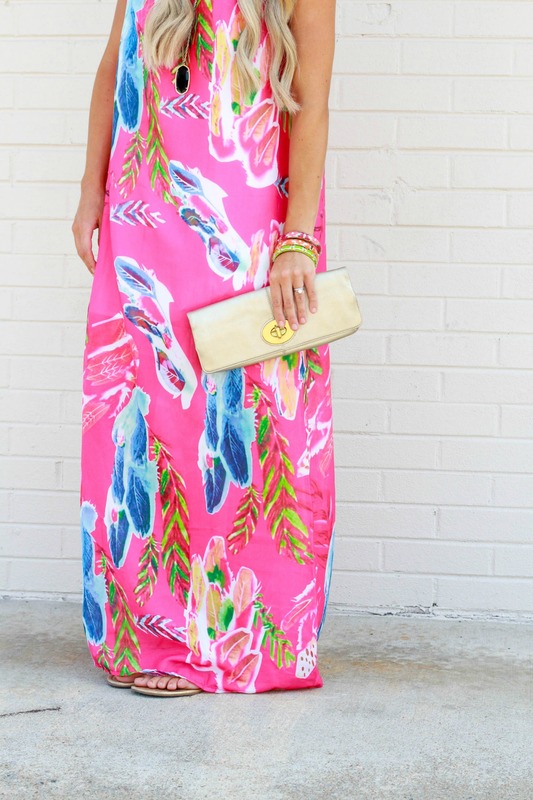 Love the colors and the print!! 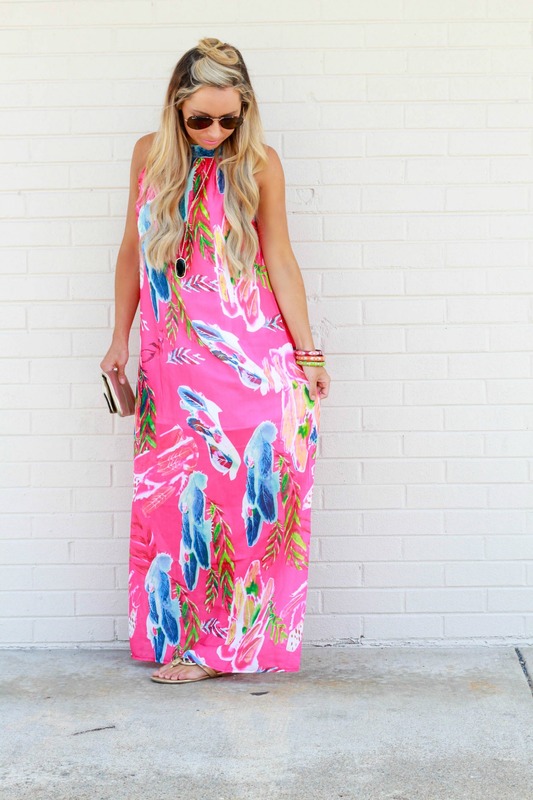 Loving the vibrant colors on this maxi!